The lengthy battle between Psion and Intel over the name 'netbook' has been settled, with Psion withdrawing its trademark registration of the term. 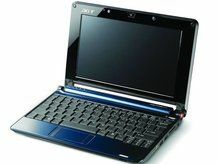 With every man and his dog calling the diminutive laptops netbooks, it seemed unlikely that Psion would be able to keep its 'netbook' trademark and now the company has agreed not to object to any manufacturer using the netbook name in the future. Complete details of the agreement between Psion and Intel aren't available but some money must have exchanged hands as at one point Psion was asking for around $1.2 billion in damages. The dispute came after Psion had trademarked the term years ago, but Intel claimed that the trademark had run out in 2003. Psion was one of the first manufacturers to make micro-sized laptops – back in 1999 its Psion 7 used an EPOC operating system, an early version of the Symbian OS found in mobile phones of today.